"Should I use oil on my human hair lace wigs and if so, which oils should I use?" When choosing human hair lace wigs, it's essential to remember that the hair (irrespective of texture) still needs to be treated like natural growth hair even though it's on a wig. All of these oils are absorbed by the hair to different extents (with coconut oil being the best for penetrating the hair cuticle). Where possible go for "cold pressed" versions as these provide the purest form of oil (yes, yes, yes, we know that oils aren't typically obtained through pressing machinery anymore, but you get what we mean, it's about oils that haven't been produced by excessive heating or the addition of other ingredients). Can hair really absorb oil? Yes. Contrary to popular (and incorrect) opinion, certain oils can be absorbed by the hair. 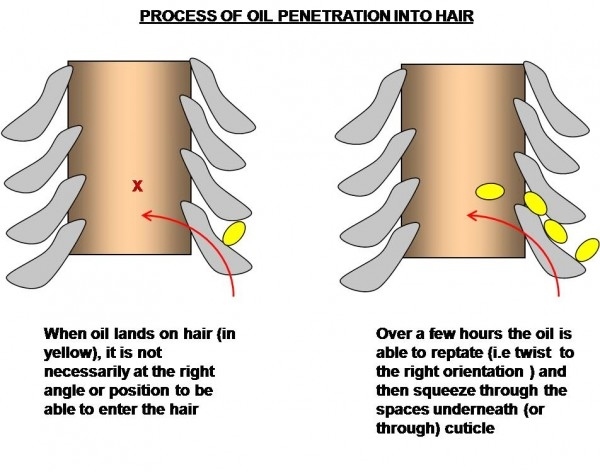 Some say it's not so much absorption as it is penetration, but the end result is the same; the oil that's placed on the outside of the hair, ends up on the inside of the hair. Why is oil penetration important for human hair lace wigs? "Why do you hate on mineral oil for hair?" Um... we don't hate on any oil... we're not even sure that anyone can hate "on" anything, but that's more about grammar than anything else. Here's the thing about mineral oil, moisture and hair; all hair needs moisture and it needs oil; what hair doesn't need is an oil that prevents the hair from absorbing moisture from the air or moisturizers because those kinds of oils cause hair to become dehydrated and prolonged dehydration causes hair breakage... which leads us to the "M" word. Mineral oil wouldn't make the cut for our imaginary Top Ten Chart of Outstanding Oils for Hair. Mineral oil basically coats the hair, it is not absorbed by hair - yes it makes hair smooth and yes it makes hair shiny, but it also prevents moisture from penetrating the hair shaft which causes the hair to become dehydrated which leads to brittleness and prolonged dehydration of hair causes breakage. We'd like to avoid any further mail alleging that we "hate on" mineral oil or petroleum oil by saying that those oils can be used for hair, if they are used for the right purpose. Hmmm and just what would be the right purpose? Well, if you want an oil that coats the hair to make it smooth and shiny, then mineral and Jojoba oils are the better choices (with Jojoba being the winner by a country mile). if you want an oil that penetrates the hair and nourishes it, then mineral and jojoba oil aren't the best choices. Using nourishing oils on your human hair lace wig is part of the overall lace wig maintenance that makes them look great and last longer. There's more information in the Lace (front and full) Wig Q&A section or if you'd like to keep up to date with the next guide about hair weave, hair extensions, wigs and hairpieces then join our blog – no personal info required.